Harry Papageorge is congratulated by Ken Empey as the 2017 Klussendorf winner. 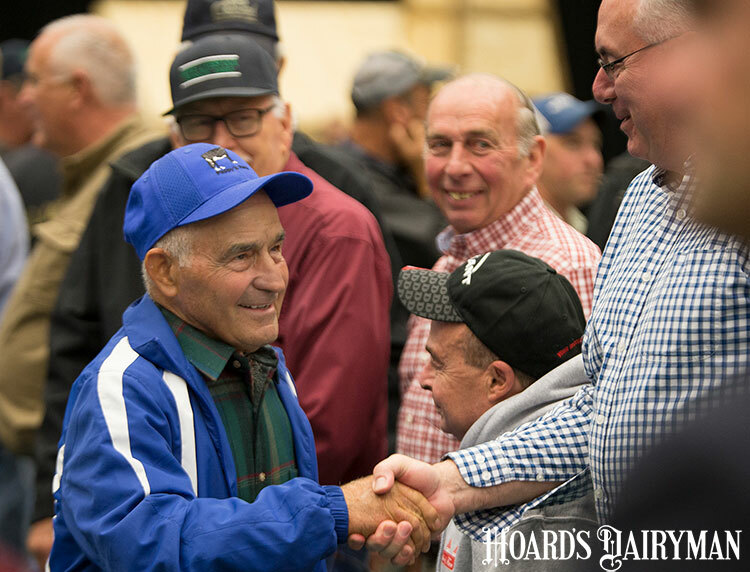 Harry Papageorge of Ogden, Utah, was named the 76th winner of the Klussendorf Award, the highest recognition given to a dairy cattle showman in the United States during the 51st World Dairy Expo. Papageorge has dedicated his entire life to the dairy industry and continues to play an active role on his family’s dairy farm because he simply loves it. Throughout the years, he has mentored many people in Holstein circles across North America. The award is given in memory of Arthur B. Klussendorf, considered an outstanding showman of his time and a model for all those who have followed him. This year’s selection was made by members of the Klussendorf Memorial Association, formed in 1937, at its annual meeting held earlier this week in Madison, Wis. Papageorge received the silver trophy designed by Tiffany Jewelers of New York City. Pappy’s Farm has bred 29 All American nominations. This includes the 2011 All American and All Canadian Winter Yearling Pappys Goldwyn Rave who was junior champion at World Dairy Expo that year. That heifer when on to be the 2012 Reserve All American Senior 2 year old taking second place at this show. On top of this, this well-known western dairy farmer has had seven Senior Best Three Female All American nominations and three Junior Best Three Female All American nominations. Papageorge also bred and owned four 95-point cows and developed Vernway Echo Violet into an Excellent 97-point cow. This year’s 76th Klussendorf winner and his farm had an impressive run at the Western National Black and White Days in Richmond, Utah, winning 21 Premier Breeder banners, 12 Premier Exhibitor awards, bred or developed 10 Grand Champions, and 5 Reserve Grand Champions. A gifted leader, Papageorge served six terms as president of the Utah Holstein Association, served eight years on the Holstein Association USA board of directors, served six years on the National Dairy Promotion and Research Board, among numerous other leadership roles. Papageorge certainly would give credit to his entire family for this honor; that includes wife Helen; and his son Ted who farms with Harry these days. Papageorge also is an accredited national judge who officiated shows in 23 states and Mexico, Canada, and Ecuador. His Pappy’s Farm has won Holstein USA’s Progressive Breeder of Registry Award for an incredible 47 consecutive years.